When a misguided suffragette hands a white feather of cowardice to an English spy, neither could have imagined the dangerous consequences that follow. Somehow I misread or misunderstood the blurb for this book. I thought it was a WWII book, which any of my regular readers know I love. Well, I was off a war. ;-) Not by Sight is set during WWI...and I thought it was great! I don't want to give anything away that you will learn of within the first few chapters! But, I found it refreshing that Kate wrote about a love that dealt more with inner beauty than outward. 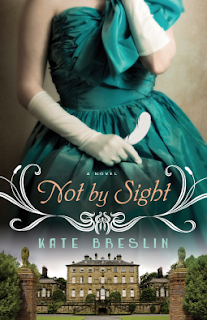 Not by Sight was a most riveting story filled with history, emotion, treason, true friendship, and true love. Thank you to Kate and Bethany House through NetGalley for sending me a copy to read and review!